hese are the results from Hastings Magistrates’ Court for July 25 - August 1. Hayley Bolton, 25, from Asten Fields, Battle, pleaded guilty to assaulting a man by beating him. The offence took place at Rye on June 21. She also pleaded guilty to causing £2,500 damage to a ban, belonging to the victim, on the same date. She pleaded guilty to driving a Citroen C3 vehicle on Cooper Road, Rye, on June 21, without due care and attention. The court made a community order with a requirement of 45 hours of unpaid work. Her driving record was endorsed with three penalty points. Dean Sheppard, 33, of Helmsmans Rise, St Leonards, pleaded guilty to driving an Audi car on St Matthews Road, St Leonards, on July 7 while more than twice over the drink drive limit. He gave a breath alcohol reading of 88 micrograms. The legal limit is 35 micrograms. He also admitted being in breach of a suspended prison sentence, made by an earlier court for being in possession of an offensive weapon in a public place. He was fined £500 and banned from driving for three years. The court also added an alcohol treatment requirement to his supervision order. Richard Benn, 37, of Kilpatrick Close, Eastbourne, pleaded guilty to being in charge of Ford Transit on Rye Road, Rye Foreign, Rye, on June 25, while over the alcohol limit. He gave a breath alcohol reading of 41 micrograms. The legal limit is 35 micrograms. He was fined £133 and his driving record endorsed with ten penalty points. Thomas Pink, 33, of Emmanuel Road, Hastings, pleaded guilty to driving an Audi car on White Rock, Hastings, on May 17, while over the drink drive limit. He gave a breath alcohol reading of 49 micrograms. The legal limit is 35 micrograms. He also pleaded guilty to driving, on the same date, with cannabis in his blood stream. He was fined £600 and banned from driving for 15 months. Robin Turner, 32, of Saxon Road, Hastings, pleaded guilty to driving a Citroen Berlingo on St Helens Road, Hastings, on May 14, with cannabis in his blood stream. He also pleaded guilty to driving with no insurance or MOT certificate on the same date. He was fined £300 and banned from driving for one year. 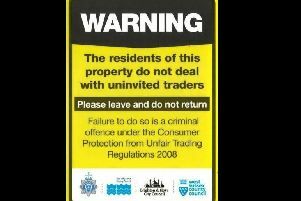 Marilyn Antrobus, 55, of Wilton Park, Beaconsfield, Buckinghamshire, was found guilty of failing to comply with an operative improvement notice relating to a category 1 hazard, namely Excess Cold and Fire, which had been served on her under section 11 of the Housing Act 2004, relating to a property at Hastings on March 13. She was fined £2,000 and ordered to pay £750 in prosecution costs. The verdict was proved in her absence. Waleed Ebahim, 38, of Falmouth Close, Eastbourne, indicated a plea of guilty to sending emails of an harassing nature when prevented from doing so by a court non-molestation order. The offence took place at St Leonards on July 2. The court made a restraining order and fined him £200. Dylan McGovern, 26, of Chapel Park Road, St Leonards, pleaded guilty to assault by beating. The offence took place at Hastings on July 15. The court made a community order with a requirement of 120 hours of unpaid work and ordered him to pay £100 compensation. George Richardson, 33, of Rectory Park, Pett, indicated a plea of guilty to being in possession of two wraps of crack cocaine at Hastings on July 12. The court made a community order with a requirement of 120 hours of unpaid work.